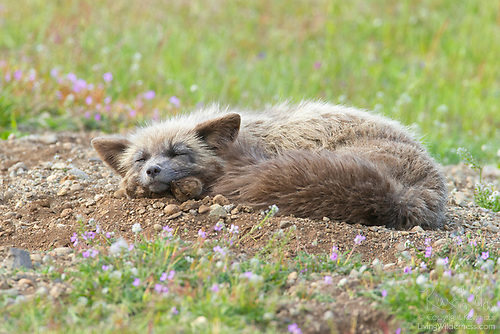 The whole purpose of the trip was to photograph young fox kits in San Juan Island National Historical Park. 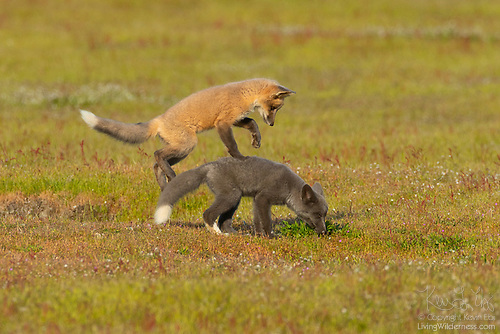 The foxes aren’t native to the island — they were introduced in the early 1900s to try to curb the number of European rabbits, which were introduced about 10 years earlier. 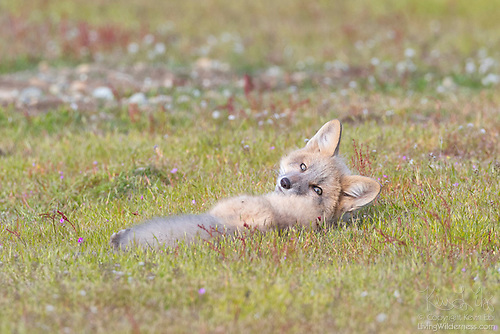 But the foxes are cute — especially when they’re just a few months old. There were about a half-dozen kits in the group that I spent the most time with. The majority of their time was spent resting (as in the image at the top of this post) and playing. All of the foxes on the island are red foxes, even if they aren’t technically red. There was a gorgeous cream-colored fox. 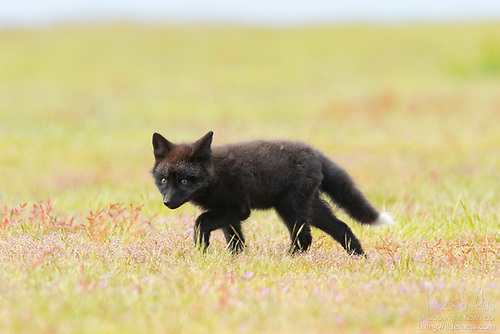 Although the young black fox probably got most of the attention from park visitors. While there are wildlife photographers and landscape photographers, I consider myself a nature photographer. I like both equally well. Even as foxes ran across the field, I saw potential landscape images. 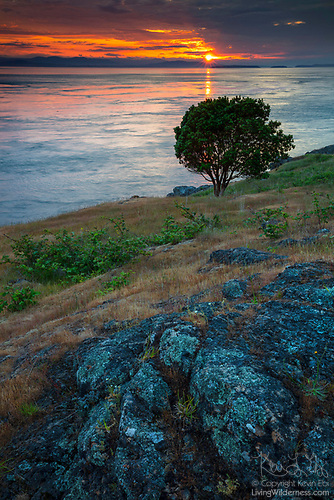 This is one of my favorite landscapes from my time on San Juan Island. 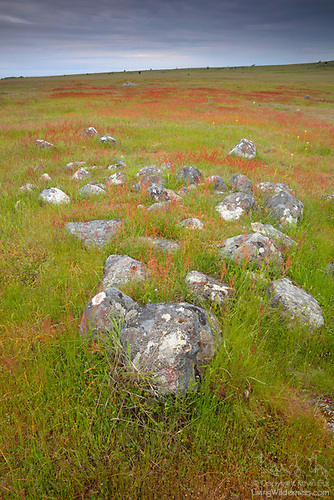 The weather wasn’t great, but I loved the red grasses sprinkled across the meadow. I used the gray rocks and sky to help them pop a bit more. San Juan Island is remote, so there’s actually a fair bit of wildlife. 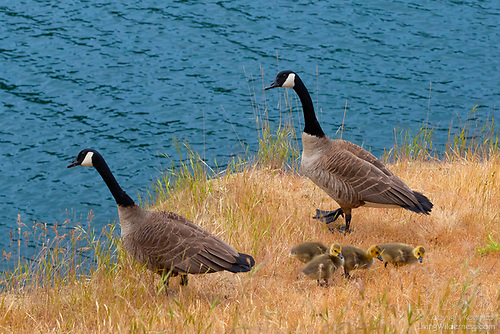 Canada geese may not be rare, but I couldn’t resist photographing this family of geese exploring a bluff over Smallpox Bay — a gorgeous area with an ugly history. The bay is named for a smallpox outbreak in 1860. Indians on Vancouver Island who contracted it were brought across Haro Strait to San Juan Island and left to die. I managed to photograph one sunset. Here, we are looking across Haro Strait toward Vancouver Island. 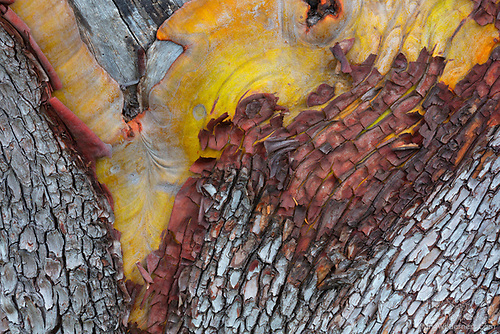 Abstract patterns on weathered trees are another favorite subject of mine. I found plenty of photo-worthy trees on the west side of the island. Here’s one of my favorite images.